Vietnam has a long coastline extending along the eastern mainland boundary and wrapping around the southern tip for 3,260 km. With 125 beaches, almost of which are beautiful beaches. Especially, Ha Long Bay, a creation of Mother Nature which is recognized as the World Natural Heritage Site by the UNESCO, Da Nang Beach voted by Forbes magazine (USA) as one of six most beautiful beaches on the planet in 2005, Bai Dai (Dai Beach) in Phu Quoc voted to be among the world's five best hidden beaches by the ABC News in 2008, Con Dao selected as one of the most impressive destinations in Southeast Asia in 2010 by the New York Times magazine, the pristine beaches of Nha Trang, one of the best beautiful beach in Asia. Besides, Vietnam is a tropical country in the northern hemisphere. With its geographical diversity, the country has inherited many famous natural tourist sites especially Sa Pa, with its beautiful terraced rice fields along mountain sides, winding along the roads, have been announced as one of seven most beautiful and spectacular terraced rice fields in Asia and the world by Travel and Leisure magazine (the United States). Da Lat is an ideal tourist area, famous for pine forests, waterfalls and many kinds of beautiful flowers (Vietnam's “honeymoon capital”). All are perfect options for newlyweds to relax and begin their new life as a couple! You will be welcomed by our guide with beautiful flower for your honeymoon in Vietnam then transfer to your hotel for check-in. A romantic room with Roses, a bottle of wine and chocolate will be ready for you! After having a rest and spend time relaxing together, we will take you to welcome dinner with candle and roses in a very romantic local restaurant in town, ending the first day of your lovely honeymoon here. After breakfast, we transfer to Ninh Binh province. Visit Hoa Lu, which is nearly one thousand years, used to be the Capital of Grand Viet ruled by Dinh and Le Dynasty. In spite of many feudal and historical conflicts, Hoa Lu still preserved its heritages with many temples and pagodas. Your one-day tour will be filled with many legend and myth. Additionally, one thing that make this tour the most exciting is the boat trip through winding stream to visit Tam Coc ( three grottoes)- regarded as “ inland Halong bay”. You will come back to Hanoi in the late afternoon and enjoy dinner at Press Club restaurant. Upon arrival at Ha Long Bay we embark on a private boat trip to cruise discovering this magnificent UNESCO World Wonder. This is a great journey among surreal islands rising from a tranquil emerald sea. In the late afternoon, we anchor for the night on the bay and enjoy a delicious seafood dinner on board. At night, you enjoy the romantic and peaceful time in the cozy and romantic room for honeymooners on the junk. Overnight on a junk boat in Halong Bay. After breakfast, the junk will take you to the bay’s most untouched areas. It will be the best time for two of you to spend time together in the great nature of the bay, discovering Ha Long Bay from distance to the detail. You can either swim on quiet beaches, visit water tunnels, fishing villages or kayaking. 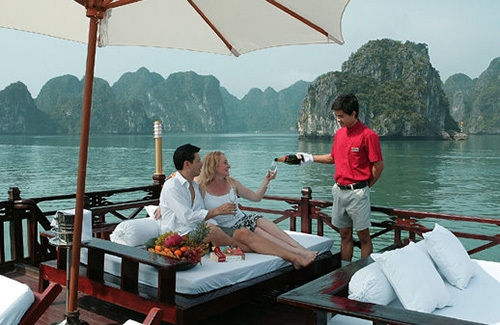 This is the best way to see and feel Halong Bay in the most close and detailed way. Lunch will be served on board by your private chef or you even can spend time together in the secluded beach, cooking for each other barbecue seafood lunch on the charcoal kitchen. In the afternoon, back to your familiar and comfortable room on the junk to enjoy very romantic and peaceful time on Halong Bay. Overnight at on board. Early morning coffee and tea will be served on the sundeck followed by a Tai Chi class. After breakfast we take a Sampan boat to explore Luon Cave. We may have a chance to see the wild monkeys that gather around waiting for food from the tourists. After that we continue to cruise around the bay. Lunch is served on the boat on our way back to the docks then we return to Hanoi. Continue on, we will take an hour Cyclo - tour viewing the charming French colonial architecture to the bustling Old Quarter and attend the performance of the unique water puppetry. Enjoy an hour body massage before returning to the hotel. The rest of time is free to relax in the hotel or shopping at the center of the city. In the morning, we will take you to the airport for flight to Da Nang; start a trip to Hoi An. Visit Cham Museum and Marble Mountain. Continue to Hoi An, check in a luxury and romantic room at a resort by the beach. Welcome dinner with candle light will be served at Nam Long restaurant. This morning we take a walking tour of the old town Hoi An. Hoi An nestled on the banks of the Thu Bon River. Before the river silted up, Hoi An was one of the most important trading ports in Southeast Asia, and a center for East-West exchange and trade. From the 2nd until the 10th century, Hoi An was one of the principal Cham cities. Over the years, Indian, Dutch, Portuguese, French, Thai, Indonesian, Spanish, American, Japanese, Filipino and Chinese ships docked in Hoi An. In the 19th century, as the result of warfare and environmental changes, Hoi An was replaced by Da Nang as a major port. Reflecting the diversity of the traders and missionaries that settled in the port (including Alexander of Rhodes), the ancient architecture is a fascinating mix of Chinese, Japanese, and Vietnamese. The rooftops of Hoi An retain a magical old world Oriental feel and are a favorite subject for Vietnamese artists. In the early 1980s Hoi An’s ancient quarters and historical monuments came under the protection and restoration efforts of UNESCO and the Polish government. Visit the Japanese covered bridge, Phuc Kien assemble hall, Phung Hung old house, Hoi An museum and Quan Cong temple. The rest of time is fee together to walk in the old town, feel the atmosphere of its original culture, enjoy shopping for tailor clothing, lanterns, shoes and food, or simply relaxing together on the beach. Free at your leisure until transfer to the Da Nang airport for onward flight to Ho Chi Minh City, the former Saigon - the biggest city in Vietnam that used to be well known with the name “The Pearl of Far East. Arrive at the airport, you are welcomed by our tour guide and transfer to the city central. We stop at the Notre Dame Cathedral and Old Post Office before checking in to the hotel. A romantic dinner will be served at Bon Sai cruise on Sai Gon River. Upon arrival, we embark on a boat trip to visit Cai Be floating market before visiting Dong Hoa Hiep, a village that makes rice paper - a crucial element in Vietnamese cuisine! We will also visit one of many local orchards where we can enjoy some of the exotic fruit before transfer back to Ho Chi Minh City. Afternoon is free to relax in the hotel or shopping at the center of the city. After breakfast, we will take you the airport for a short fly to Phu Quoc, the most beautiful island in Vietnam. Upon arrival, pick you up and transfer to the resort by the beach. A room with Roses, Candles, Chocolate and a bottle of wine is ready for you. The rest of the days is enjoying beautiful beach, swimming pool in the resort. Today you will have the whole free day to relax at the resort. There is an option to take a motorbike tour to Sao beach, indulge yourselves into the most beautiful beaches in Vietnam with the snow-white sand, and enjoy the quietness of the isolated beach. Full day is free time to discover the island or swimming on the beach. Free at your leisure until transfer to the airport for flight to Ho Chi Minh City, connecting the onwards flight. * The price of this trip changes a lot according your group number, travel season and tour class. Please contact one of our travel consulttants for the most detailed qoutation. We ensure the LOWEST price. Quickly find a vacation in Vietnam by our search box, or simply let’s know your needs and tailor-make an itinerary for you free of charge.